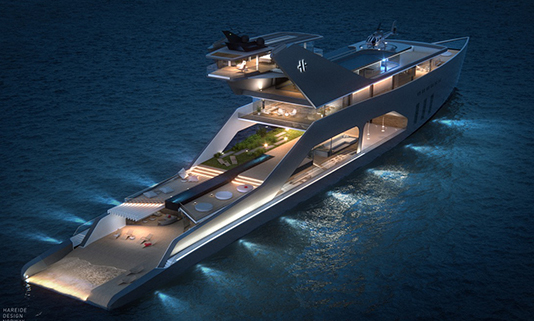 Usually owners take every possible precaution to ensure that their superyacht doesn’t spring a hole, but Hareide Design has intentionally driven a massive gaping orifice through the hull of their concept yacht – and it looks sensational. 108 metres in length (that’s around the same length as Abramovich’s Luna) this superyacht has been put together by 57-year-old Einar Hareide, a Norwegian industrial designer and former design director for SAAB. Unmistakably Scandinavian in its appearance, with modern lines and elegant simplicity, Einar’s intention was to create a floating boutique hotel complete with central multifunctional grand hall (the ‘hole’) to connect passengers to the natural beauty surrounding the yacht and expose them to the changing elements. This hall can be used for concerts, dancing, movies, parties, presentations, you name it, and, with double-height floor-to-ceiling glazing, a wonderful maritime backdrop is guaranteed. Set just above this main deck grand hall is an elevated dining and (360º) viewing area as well as a 20-metre-long lap pool flanked by luscious foliage and tranquil planting, a rare floating garden. 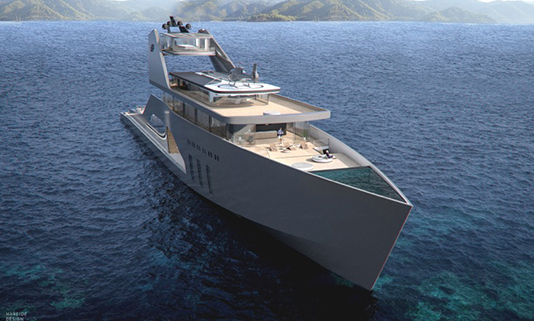 This lap pool isn’t the only pool in this Hareide Design superyacht, you’ll also find a triangular segment of pool slotted perfectly into the front of the bow, which must be new and unique to the industry, and a sunlounger-supervised shallow wading pool to the aft of the main deck which splashes directly into the sea behind – again of a kind never seen before. Move a step higher and there’s a handy helipad for getting guests in and out and, reaching even further into the sky, an observation deck with private viewing balcony to soak up the sights in the most decadent fashion. Of course the environmentally aware Norwegians can be relied upon to consider the eco-credentials of this concept. Einar has incorporated 300m² of solar panelling to power a bank of lithium-ion batteries, they should keep her going for noise-free low-speed coastal cruising. For everything else there will be diesel-electric engines. 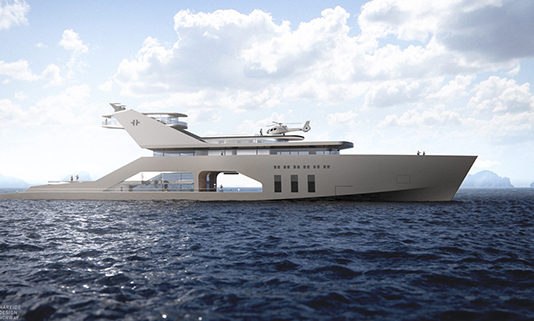 A real hybrid yacht. Hareide Design was established by Einar in 1999 and works across a wide range of industries, from maritime to product to automotive. The talented team is multi-award-winning and has been internationally recognised in museums from New York to hometown Oslo.